This afternoon, we saw a bull elk up above the Malaspina trail where we were walking. We often spot the herd of Roosevelt elk in that area, as many as thirty, and even when we don’t actually see them, their signs are everywhere: the print of their cloven hooves in the mud, their droppings, and even the smell of them, dusky as horses. But today, it was just the bull, still in his yellow summer coat, with a huge set of antlers. Once I heard the whistle the bulls make during the fall rut and it was both eerie and beautiful. This guy saw us too and then ran along the bluff, keeping us in sight before he disappeared into the maples. I love the fall. 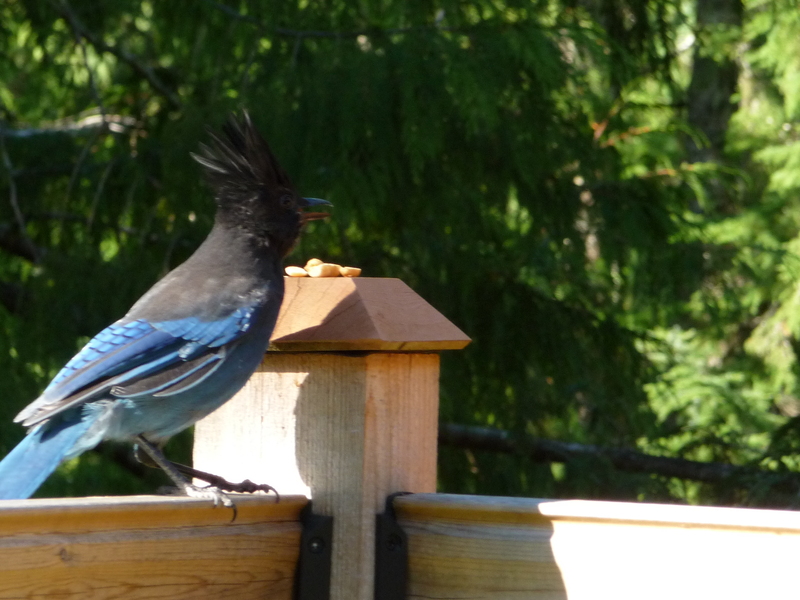 The Steller’s jays return from wherever they spend the summer and announce their arrival with a squawk. Here’s one gobbling the peanuts I put out to welcome him back. And here are the true jewels of fall. 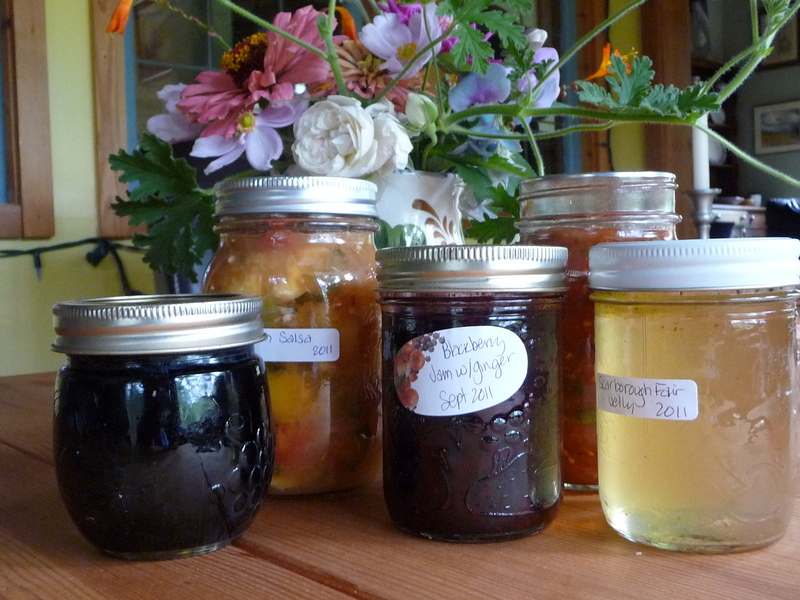 Our pantry shelves are lined with jars of the summer’s bounty: blackberry jam, salal jelly, herb jellies, peach salsa, tomato salsa, peach and apple chutney. Such a gift in winter, to take a jar from the dark shelf and open it for its concentrated flavours of sunlight and warm earth. ~ by theresakishkan on September 18, 2011. This entry was posted on September 18, 2011 at 10:44 pm and is filed under Uncategorized.You can follow any responses to this entry through the RSS 2.0 feed.You can leave a response, or trackback from your own site.